Episodes: 48 & 51. Site Numbers: 85, 176, 178, 180, 182, 186, 187, 189, 258, 259. Date Posted: 29 June 1997. Update 1999. Location: Various. Type: Buildings. In my 'Low-Latitude' database I seem to have far more residential addresses associated with Sir Ernest Shackleton than other Antarctic explorers. I've tracked down and personally visited probably half of them as of early 1998. But any new information on those included--or yet to be discovered--will be greatly appreciated. 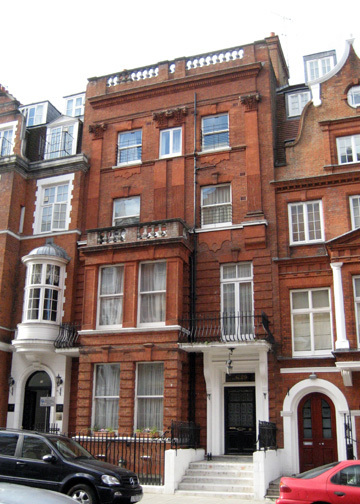 The Shackletons took a furnished house at Palace Court, Bayswater Road, London, for a month or two in 1906. This was during the planning phase of the Nimrod expedition, the offices of which were at 9 Regent Street, Waterloo Place (182). I haven't discovered the exact address in Palace Court; the photograph below is of the east side of this short street. In July of 1910 the Shackletons "moved down from Edinburgh to Sheringham in Norfolk, where the family was installed in a furnished house..." Its name was Mainsail Haul. (186) Again, the exact address is a mystery to me. Or it was until recently (September 1999) when Phil Cantor sent me some information and a photograph, included here. 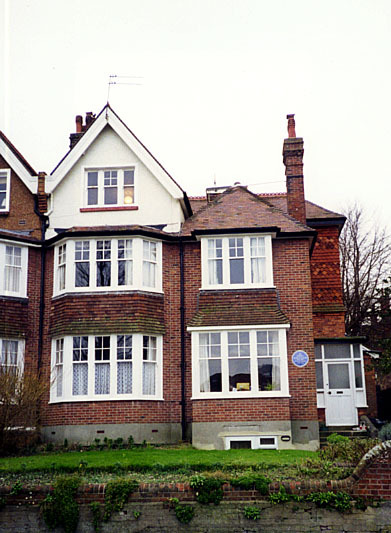 His mother-in-law, Heather Highcock, was born in Sheringham, and on a recent trip there was able to determine that Shackleton rented the house from a Naval officer named Commander George Dolphin. The house is known today as 'Martin Cross' and has since been converted to flats. It's at the corner of St Nicholas Place, almost opposite the War Memorial. 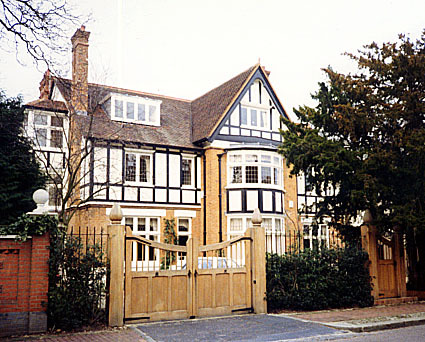 In April of 1911 the Shackletons moved to 7 Heathview Gardens, Putney Heath, London (187). This address is not very far from where L.E.G. Oates lived for a time (see Episode 4). It's a quiet street with some very nice houses. 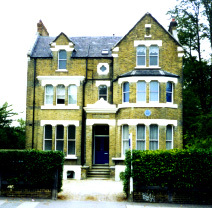 From Putney the next move was to 11 Vicarage Gate, Kensington (189), in 1913. This stately terrace house, dating from the 1860s, is now the Abbey House Hotel. Other residents have included a bishop and a member of Parliament. It's just east of Kensington Church Street. In later years the Shackletons, certainly Emily and the children, spent time at Eastbourne on the Sussex coast. Sir Ernest was there between April and December, 1919, from June to December 1920 and April to August, 1921 (258). Major sources: Shackleton, Roland Huntford; The Life of Sir Ernest Shackleton, Hugh Mill; Shackleton, Margery & James Fisher. 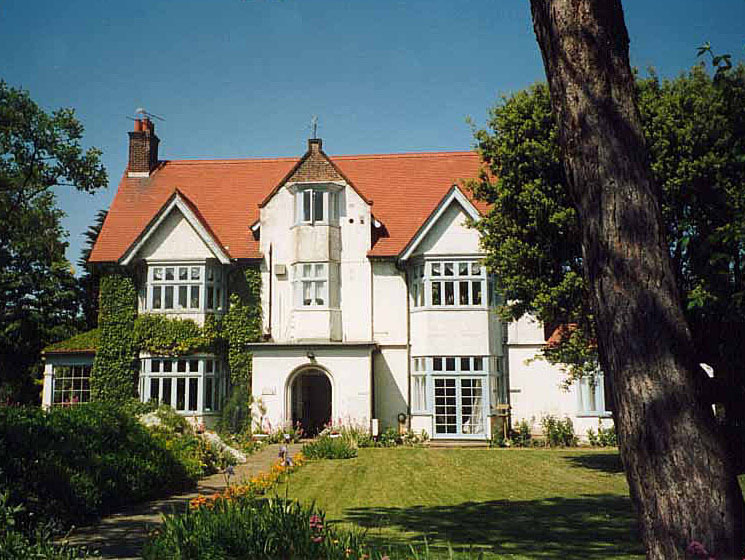 A few episodes back I listed some of the many addresses that the Shackleton's called home over the years. I related that "In later years the Shackletons, certainly Emily and the children, spent time at Eastbourne on the Sussex coast. Sir Ernest was there between April and December, 1919, from June to December 1920 and April to August, 1921." This elicited some helpful follow-up information from Judith Faulkner in Surrey. She wrote to say that she had visited the Eastbourne house in June 1994 and that it had, shortly thereafter, been honored by a ceramic blue plaque placed on the ground floor facade by the Eastbourne Civic Society and the Eastbourne Borough Council. The accompanying newspaper cutting (East Sussex Eastbourne Evening Argus) notes that Shackleton lived at 14 Milnthorpe Road "...for the last five years of his life before he died in 1922." The unveiling, on the 23rd of November 1994, was overseen by Shackleton's granddaughter, Alexandra Bergel. The photographs accompanying Ms Faulkner's letter show a 2-1/2 story semi-detached brick house on a tree-lined street.